INSTANT PHOTO-SOFT COVERAGE FOR ALL. LONGWEAR, LIGHT AS AIR, CREASEPROOF. Click to meet your Pro Filt'r concealer match for every need. A creamy, longwear, creaseproof liquid concealer that delivers light-as-air, medium to full coverage in a groundbreaking range of 50 easy-to-shop soft matte shades. Whether you’re hiding bags and blemishes or hangovers and bad decisions, your secret’s safe with Pro Filt’r Instant Retouch Concealer. The full coverage cure to living life to the fullest, Pro Filt’r is the closest thing to retouching your skin in reality. 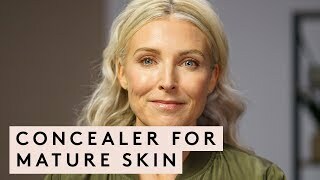 This creamy, light-as-air, soft matte concealer easily builds to full coverage, instantly brightening under eyes, concealing blemishes and dark spots, and reducing redness. Choose from 50 easy-to-shop shades, each created to complement—not match—your Pro Filt’r foundation. Not sure where to start? 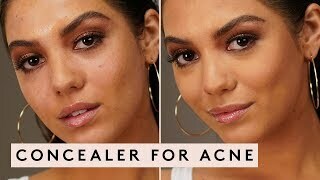 Try your foundation shade number, then adjust as needed depending on what you want to conceal. Experience instant photo-ready coverage that lasts all day without creasing or settling into fine lines or pores. 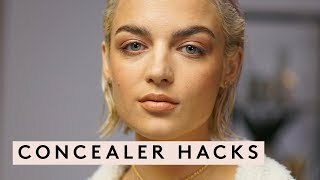 This sweat-resistant formula will work on your skin no matter where you go, guaranteed to keep up no matter how late you stay up or wild out. SHADE 100: AQUA/WATER/EAU, HYDROGENATED DIDECENE, HYDROGENATED POLYISOBUTENE, TRIMETHYLSILOXYSILICATE, CETYL PEG/PPG-10/1 DIMETHICONE, GLYCERIN, METHICONE, NYLON-12, DISTEARDIMONIUM HECTORITE, DIMETHICONE, SODIUM CHLORIDE, ACRYLATES/POLYTRIMETHYLSILOXYMETHACRYLATE COPOLYMER, POLYMETHYLSILSESQUIOXANE, HYDROGENATED STYRENE/ISOPRENE COPOLYMER, HYDROXYACETOPHENONE, LAURYL PEG-8 DIMETHICONE, HDI/TRIMETHYLOL HEXYLLACTONE CROSSPOLYMER, 1,2-HEXANEDIOL, CAPRYLYL GLYCOL, TOCOPHERYL ACETATE, TRISODIUM ETHYLENEDIAMINE DISUCCINATE, TALC, LAUROYL LYSINE, COMBRETUM FRUTICOSUM FLOWER NECTAR, ALCOHOL, BUTYLENE GLYCOL, PENTAERYTHRITYL TETRA-DI-T-BUTYL HYDROXYHYDROCINNAMATE, CENTELLA ASIATICA LEAF EXTRACT, CAMELLIA SINENSIS LEAF EXTRACT, TITANIUM DIOXIDE (CI 77891), IRON OXIDES (CI 77491, CI 77492, CI 77499). SHADES 105, 110, 130, 140, 145, 150, 160, 170,180, 185, 190, 200, 210, 220, 230, 235, 240, 250, 260, 270, 280, 290, 300, 320, 330, 340, 345, 350, 360, 370, 385, 390, 400, 410, 420, 430, 440, 445, 450, 460, 470, 480, 490, 495, & 498: AQUA/WATER/EAU, HYDROGENATED DIDECENE, HYDROGENATED POLYISOBUTENE, DISTEARDIMONIUM HECTORITE, TRIMETHYLSILOXYSILICATE, CETYL PEG/PPG-10/1 DIMETHICONE, GLYCERIN, NYLON-12, DIMETHICONE, METHICONE, SODIUM CHLORIDE, ACRYLATES/POLYTRIMETHYLSILOXYMETHACRYLATE COPOLYMER, POLYMETHYLSILSESQUIOXANE, HYDROGENATED STYRENE/ISOPRENE COPOLYMER, HYDROXYACETOPHENONE, LAURYL PEG-8 DIMETHICONE, HDI/TRIMETHYLOL HEXYLLACTONE CROSSPOLYMER, 1,2-HEXANEDIOL, CAPRYLYL GLYCOL, TOCOPHERYL ACETATE, TRISODIUM ETHYLENEDIAMINE DISUCCINATE, TALC, LAUROYL LYSINE, COMBRETUM FRUTICOSUM FLOWER NECTAR, ALCOHOL, BUTYLENE GLYCOL, PENTAERYTHRITYL TETRA-DI-T-BUTYL HYDROXYHYDROCINNAMATE, CENTELLA ASIATICA LEAF EXTRACT, CAMELLIA SINENSIS LEAF EXTRACT. MAY CONTAIN/PEUT CONTENIR (+/-): TITANIUM DIOXIDE (CI 77891), IRON OXIDES (CI 77491, CI 77492, CI 77499). SHADES 255 & 310: AQUA/WATER/EAU, HYDROGENATED DIDECENE, HYDROGENATED POLYISOBUTENE, TRIMETHYLSILOXYSILICATE, CETYL PEG/PPG-10/1 DIMETHICONE, GLYCERIN, NYLON-12, DIMETHICONE, DISTEARDIMONIUM HECTORITE, ACRYLATES/POLYTRIMETHYLSILOXYMETHACRYLATE COPOLYMER, METHICONE, SODIUM CHLORIDE, POLYMETHYLSILSESQUIOXANE, HYDROGENATED STYRENE/ISOPRENE COPOLYMER, HYDROXYACETOPHENONE, LAURYL PEG-8 DIMETHICONE, HDI/TRIMETHYLOL HEXYLLACTONE CROSSPOLYMER, 1,2-HEXANEDIOL, CAPRYLYL GLYCOL, TOCOPHERYL ACETATE, TRISODIUM ETHYLENEDIAMINE DISUCCINATE, TALC, LAUROYL LYSINE, COMBRETUM FRUTICOSUM FLOWER NECTAR, ALCOHOL, BUTYLENE GLYCOL, PENTAERYTHRITYL TETRA-DI-T-BUTYL HYDROXYHYDROCINNAMATE, CENTELLA ASIATICA LEAF EXTRACT, CAMELLIA SINENSIS LEAF EXTRACT. MAY CONTAIN/PEUT CONTENIR (+/-): TITANIUM DIOXIDE (CI 77891), IRON OXIDES (CI 77491, CI 77492, CI 77499). SHADE 380: AQUA/WATER/EAU, HYDROGENATED DIDECENE, HYDROGENATED POLYISOBUTENE, TRIMETHYLSILOXYSILICATE, CETYL PEG/PPG-10/1 DIMETHICONE, GLYCERIN, NYLON-12, DIMETHICONE, DISTEARDIMONIUM HECTORITE, ACRYLATES/POLYTRIMETHYLSILOXYMETHACRYLATE COPOLYMER, METHICONE, SODIUM CHLORIDE, POLYMETHYLSILSESQUIOXANE, HYDROGENATED STYRENE/ISOPRENE COPOLYMER, HYDROXYACETOPHENONE, LAURYL PEG-8 DIMETHICONE, HDI/TRIMETHYLOL HEXYLLACTONE CROSSPOLYMER, 1,2-HEXANEDIOL, CAPRYLYL GLYCOL, TOCOPHERYL ACETATE, TRISODIUM ETHYLENEDIAMINE DISUCCINATE, TALC, LAUROYL LYSINE, COMBRETUM FRUTICOSUM FLOWER NECTAR, ALCOHOL, BUTYLENE GLYCOL, PENTAERYTHRITYL TETRA-DI-T-BUTYL HYDROXYHYDROCINNAMATE, CENTELLA ASIATICA LEAF EXTRACT, CAMELLIA SINENSIS LEAF EXTRACT. MAY CONTAIN/PEUT CONTENIR (+/-): TITANIUM DIOXIDE (CI 77891), IRON OXIDES (CI 77491, CI 77492, CI 77499). Apply directly under eyes or over blemishes and blend with the Precision Concealer Brush 180 or Lil Precision Makeup Sponge Duo 105. Start with a very thin layer and build as needed—a little goes a long way! 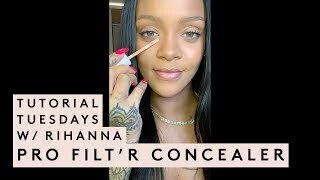 RIHANNA’S WAY: When brightening under eyes, let Pro Filt’r concealer dry completely before setting with Pro Filt’r Instant Retouch Setting Powder. 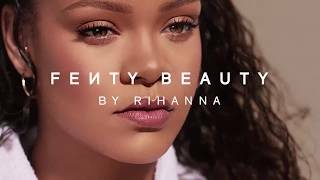 Rihanna likes to set as the very last step in her makeup routine for the best results. PRO FILT'R is rated 4.6 out of 5 by 117. Rated 5 out of 5 by Rrmoe72 from Awesome concealer I absolutely love this concealer, it doesn’t dry out and works amazingly on my face. Rated 4 out of 5 by teaspilled from Skin? Perfect. Flawless. Stunning. Teenage boys fear many things; an unzipped fly, rooting for the losing team, their female counterparts. But for me, it is the “are you.. *dramatic inhale* wEaRInG MaKEuP?” scenario. 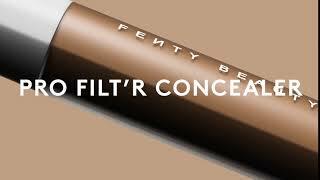 Rihanna’s Fenty Beauty released the new Pro Filt’r Instant Retouch Concealer and I have nothing to fear. This stuff is magical. The price point is very well placed for 8 ml as a luxury makeup brand. What’s better? The results. 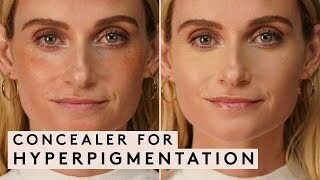 I do not wear any foundation and use this concealer to lighten up the highpoints of my face. This makes my skin look p e r f e c t. I prep with a water-based moisturizer and go right in. This is a dryer, matte, and a fast-drying formula, so I recommend doing one eye at a time. 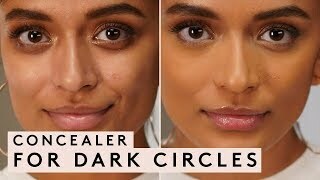 This formula is also extremely very high coverage, so I use a dot on either side of my eyes and blend in, as I have some fine lines under my eyes I don’t want a party in. Afterwards, I highly recommend setting this with a powder, as it will not crease or budge for the, wait for it, e n t i r e day. I do not recommend this concealer for anyone with dry skin (this is why this concealer only gets a four out of five shining stars from me), as it is very dry, but would recommend a creamy, hydrating concealer. Wrapping things up, I must say that I do not look like I am wearing makeup at all. My skin looks flawless and like every teenagers dream. It almost beckons me to say “Worship me peasants!”. Rated 5 out of 5 by Ari06 from It worked very well I just bought it in sephora and it was amazing! It matched perfectly and it gave the desired coverage. It is light weight and I dont feel like I have anything on my skin. I have heard great things on it and I agree. Totally recommend. Rated 5 out of 5 by Jenniferbueno053 from Beyond amazed Today I had an argument with my mans right and me an emotional reck was crying so much on and off and this concealer did not smudge one bit. It was also used with the setting powder and I was so shoook it didn’t crease or anything !!! Rated 5 out of 5 by Subira from Love!!!! I brought a few shades of Fenty Pro FILT'R .. and I am SO happy with the results of them all. I have 330, 380 and 400. Fenty foundation is the BEST as well!! I usually only use concealer as my foundation. but I decided to try fenty foundation and I'M SUPER HAPPY. Going to buy so much more from here.. You got a CUSTOMER for life!! Rated 1 out of 5 by Sambo from Cakey I went especially to Harvey Nix to purchase this concealer and had very high hopes. The assistant helped with choosing shade which was a great match and applied it for me. It looked great at the time so I bought it and the applicator brush. However a couple of hours later after lunch I went to the bathroom and was horrified to see what looked like flaky crazy paving all around my eyes! This product may work on young wrinkle free skin but for the older woman I certainly would not recommend it! Very disappointed and £40 out of pocket.